Introducing ‘SUMMER IN THE CITY’ Acrylic on paving slab. I’m so happy to have been invited to paint on a paving slab for Pavement Licker. 50 artists from all over the world were asked to create 50 artworks on paving slabs for a charity auction organised by Helium London. It’s an honour to have my artwork alongside artists like Anthony Gormley, Ralph Steadman, Anthony Lister and lots more!! The auction will raise £s for a charity helping children with Retts Syndrome rettuk.org. I’m honoured to have been asked to do this by Josh Josh Jones and hope my contribution can help raise some dosh! The paving slabs will be displayed at an exhibition on Portland Place in London on 4th October, but you can register online to bid from today, please make sure you register before 1st October if you would like to bid. The minimum bid is £1000, and it is a lucky dip as to which artist’s work you will go home with! 100% of sales to Rettuk.org. On Sunday 10 December I took part in the first ever Wasps Artist and Maker Christmas Market at The Briggait in Glasgow. Wasps studio holders from across Scotland took part. It's the first time I have shown my artwork since moving to Glasgow in the summer, thank you to all the interesting and lovely people who stopped by at the stall for a chat. I was selling prints, books, original works and some hand painted festive baubles. It was nice to show some work in Glasgow and to chat to people about my book - and the baubles were very popular and sold out really fast! I would love to paint some more but there's not much time left before Christmas now (maybe next year). Earlier this year I was approached by Dr. Robert from The Blow Monkeys, he wanted to know whether I would be interested in creating the artwork for their forthcoming album. Of course I said yes! (I've always wanted to create artwork for an album cover). The album will be released on vinyl on October 7th, with a launch night at the 100 Club in London to celebrate. It's out on Monks Road Records. I haven't seen the actual vinyl yet, but I got a sneak preview of the proofs which was very exciting! Thank you to everyone who came to the book launch, thank you to Atom Gallery for hosting it! 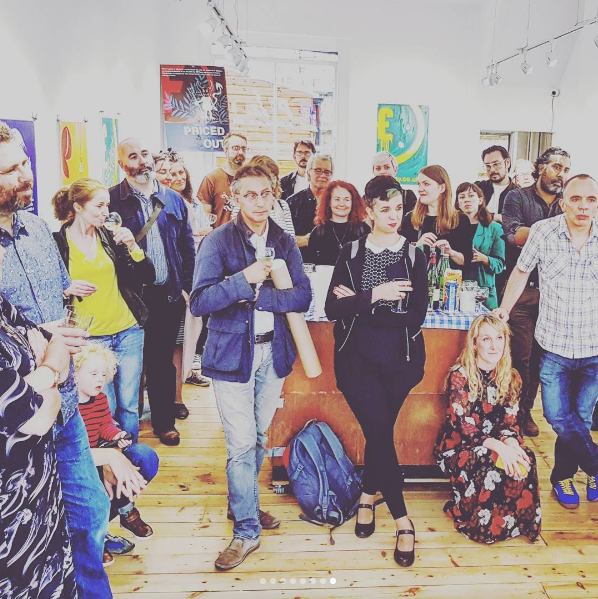 Thank you to everyone who bought books and postcards, and listened and helped us to celebrate the launch of Priced Out. And the biggest thanks to Dunlin Press who were the most supportive publishers I could ever have had the privilege to work with. Booze was drank and the gallery was filled with talented, interesting people, it was a lovely evening and one of my last nights in London as an official London resident in the city. A few days after the book launch we set out on a new adventure, leaving our home of nearly 20 years to move to Glasgow. Back in 2016, independent publishers Dunlin Press approached me to ask if I would like to create a book with them. 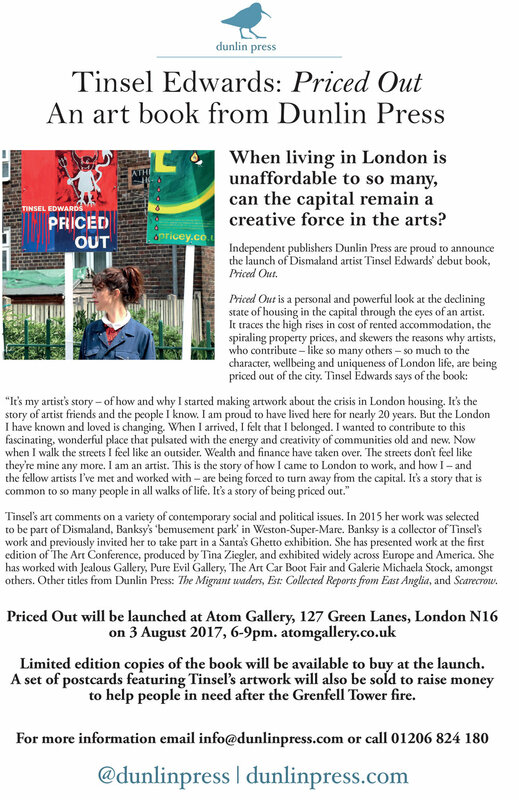 Priced Out is my debut book and it tells the story of my life as an artist in London, and how and why I started making artwork about the crisis in London housing. 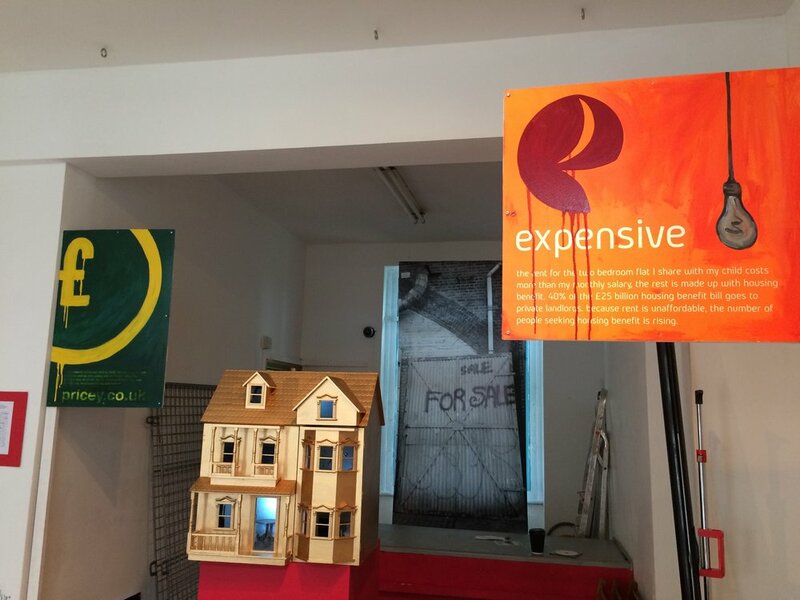 "Priced Out is a personal and powerful look at the declining state of housing in the capital through the eyes of an artist. It traces the high rises in cost of rented accommodation, the spiraling property prices, and skewers the reasons why artists, who contribute - like so many others - so much to the character, wellbeing and uniqueness of London life, are being priced out of the city." Images from Spirit House at 18 Malden Road, NW5. Curated by Nicola Lane, this evolving exhibition invited people in to share their memories of the changing area on the interactive map. There were films and photographs on display, exploring the gentrification of Kentish Town. I created a new series of paintings which were displayed in an estate agent style grid in the window. Curator Nicola Lane approached me to ask if I would like to put some work into her evolving Spirit House exhibition. 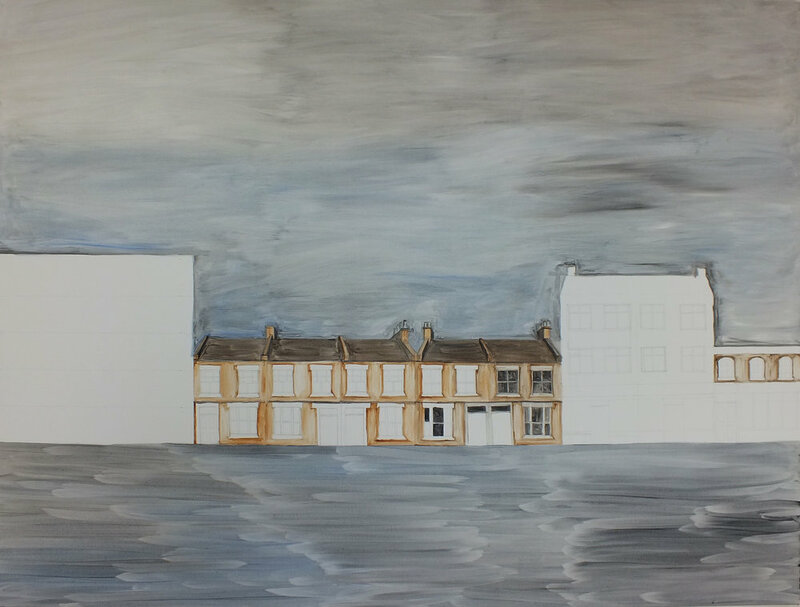 I've been busy in the studio creating some new paintings which will form an estate agent style grid display in the window, my work will be on display during the last week of Spirit House. 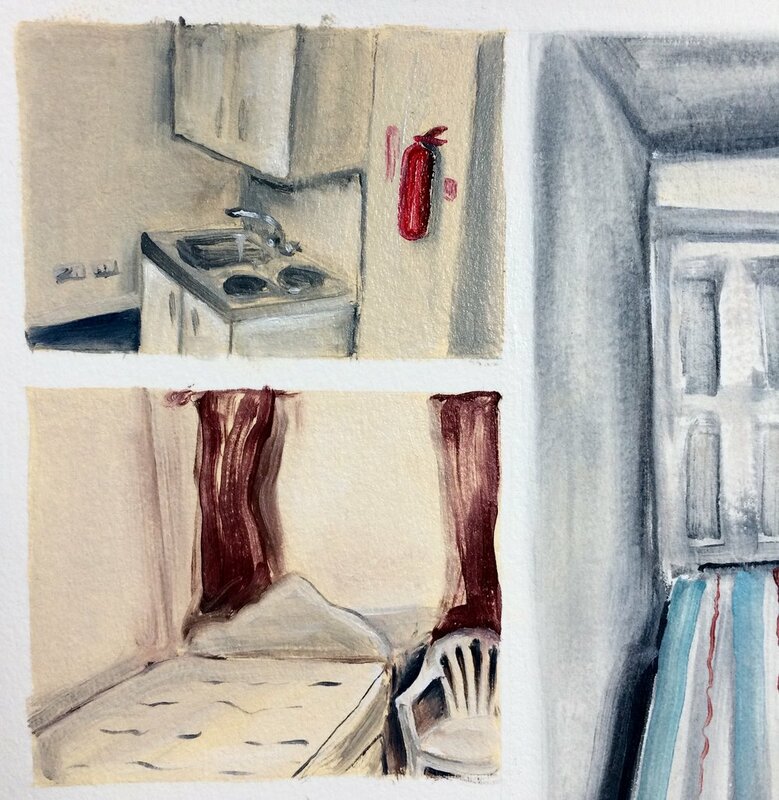 As part of Camden Council's pop-up shop project which brings unused & vacant council-owned retail spaces into use for local artists, start-ups and entrepreneurs, artist filmmaker Nicola Lane has been allocated 18 Malden Road in Kentish Town in which to create her SPIRIT HOUSE. SPIRIT HOUSE is inspired by childhood memories of living in Bangkok where every property has a ‘spirit house’. These miniature temples are shrines to spirits of place & shelters for the ‘Guardian Spirits of the Land’. New Thai landowners leave existing spirit houses intact & build a new ones alongside; you often see a demolition site where all that remains is a solitary spirit house. Nicola and Geddes Gallery will transform 18 Malden Road into a shelter for community memories and a shrine for spirits of place, exhibiting local archives from Holborn Library, sourcing memories through interactive events for both community & passing visitors, with workshops, film screenings, installations & exhibitions of memories & artworks. My daughter Joni was born on 3 November 2016, later that week Donald Trump was elected as President of the U.S.A. Shocked and in disbelief, I found it hard to process the news. All of a sudden the ideas I had for my next art project didn’t seem to be urging me on with quite as much force anymore. The enormity of the Trump thing is terrifying, it is like a permanent heartache, a niggling worry, I go about my daily life and occasionally I forget, but it always comes back. I’m not ready to make any work about it yet, perhaps I never will. But the arrival of Trump, combined with the arrival of Joni have somehow meant that I am not ready to make the work I had planned to make during my maternity leave. I’ve always got a billion ideas buzzing around in my mind, the installation I want to make, the 25 colour screen print that I can visualize layer by layer, the T-shirt project! The series of paintings. But they all need money, and they all need time. The arrival of baby Joni has brought so much joy, the days are filled with precious and magical moments, but each day and week is also filled with frustration, repetition and tiredness. Whilst having a rare moment to sit down with a cup of tea, in amongst piles of laundry, in between feeds and after multiple nappy changes, I find myself staring at instagram accounts of artists, consumed by an overwhelming feeling of wanting to paint. Daydreaming about the unknown future point in time when I can make that installation, and finally finish that painting series that I’ve been planning for so long. So I started painting with what I had, limited resources and limited time. 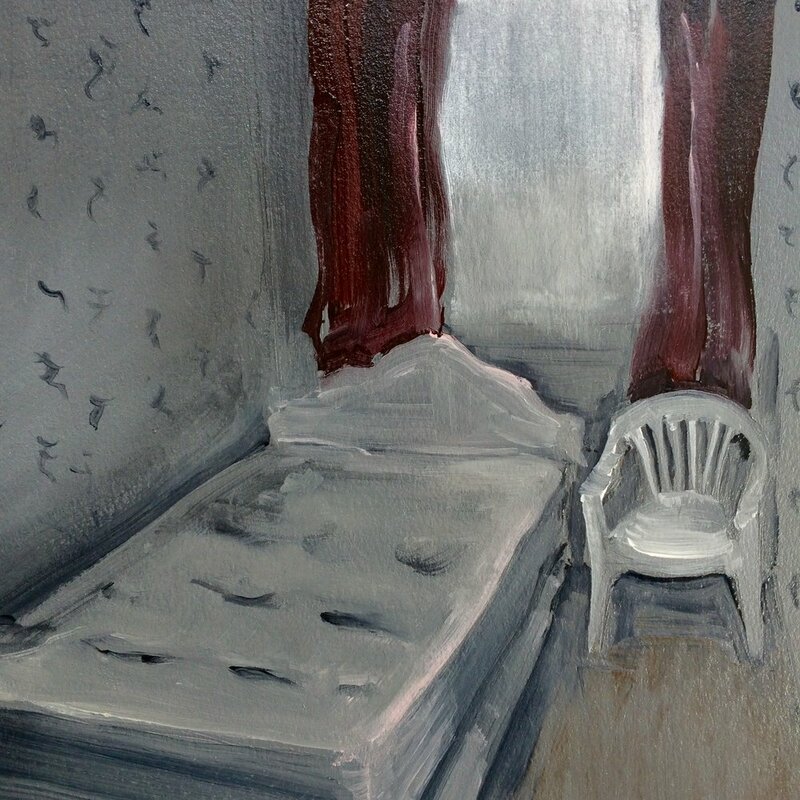 Objects from around the home, painted quickly - 30 minutes here, 30 minutes there. Whilst Joni sleeps. I painted the washing hanging on the clothes rail, the bouncy chair (the pram in the hallway?!). I’m not sure yet what these paintings are, or what they are leading to. My artwork is usually an expression of my emotions, thoughts and opinions, it often comments on social injustice. During a time of political turmoil, these paintings don’t do that! But at least I am painting, and they are documenting a most precious and frustrating moment in time. I have been working on a commissioned painting for a record label since September, and today I finally finished it! Monks Road Records will launch in Spring next year, it is an independent label which will specialise in vinyl and analogue. I was asked to create a mythical Monks Road, a place filled with a community of artists and musicians. 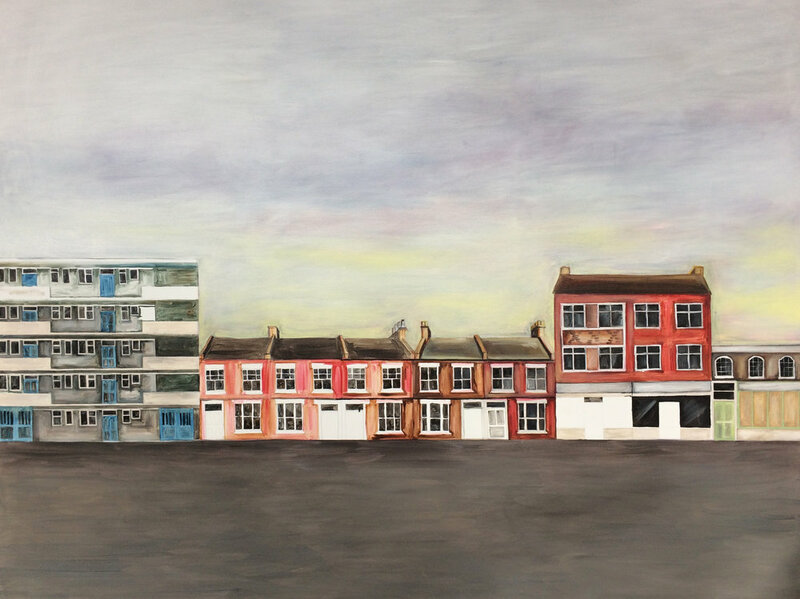 I created a composition based on a mixture of familiar architecture in East London, terraced houses in Stepney, 1960s council blocks, Victorian shops with flats above...The painting is 2m x 1.5m and at the moment it is waiting to be shipped to the label headquarters in the New year. Some of my screenprints will be on display at the launch exhibition for Atom Gallery's new premises this Friday. 'Excited State' is an exhibition of contemporary screenprints, linocuts and letterpress by 23 artists. Everything in the show is for sale, I will be selling some screenprints on paper which were made for Dismaland but weren't shown. Could they be the perfect house warming gift? Or a nice christmas pressie?! Priced at £125 each, they are 2-3 colours, low editions, and each one has a hand painted element. 10% of any of my sales will be going to the housing charity, Shelter. 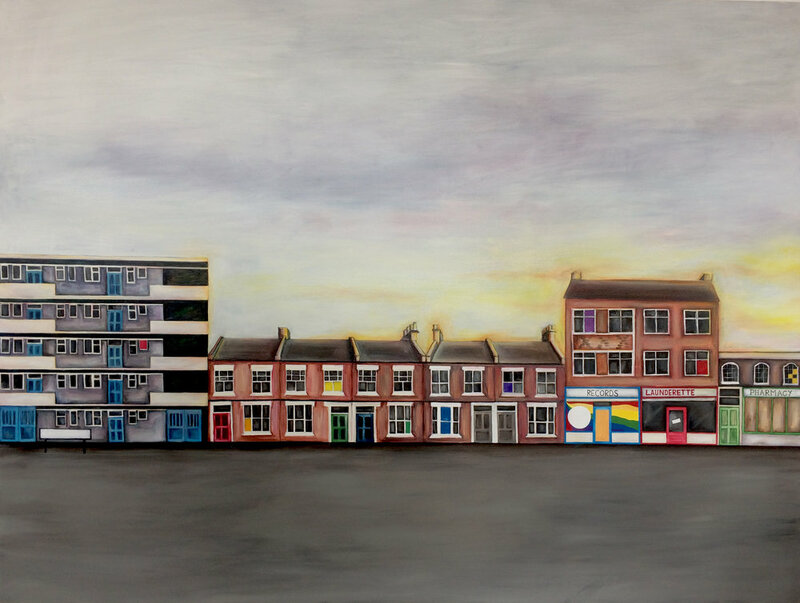 'Studio Flat in Kings Cross' oil on board, 41 x 65 cms. 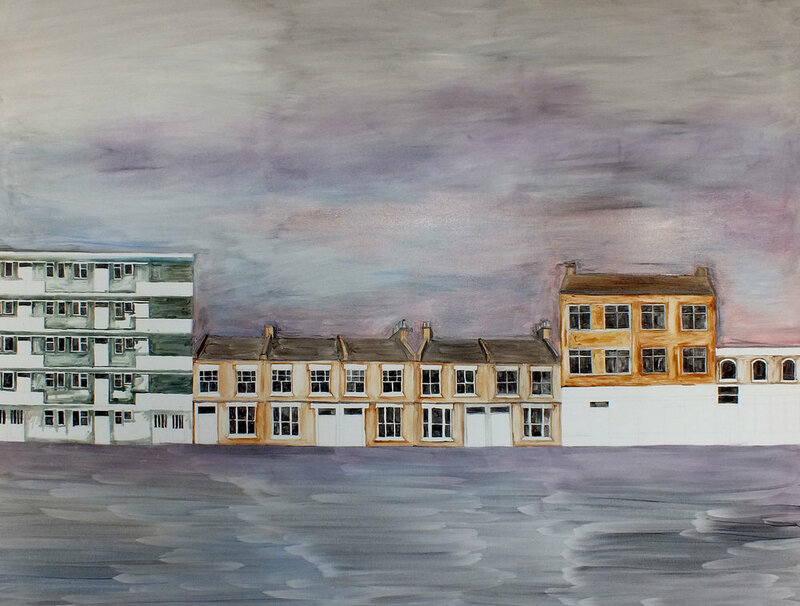 This piece is based on an image of a flat which was advertised online for £737pcm, and rented within half a day. All the essentials for a 'Studio Flat' were shoved into this tiny space, there was barely enough room to open the kitchen cupboards without the bed blocking them, I'm not sure how anyone would cook in there! The advert quickly went viral, with thousands of people sharing it in disbelief. The sad thing is that many flats like this rent in a similar amount of time, such is the shortage of decent housing, people will take what is available at an inflated cost, and many (but not all) landlords continue to exploit this situation in London. Art on a Postcard will launch their exhibition on 12 November at Maddox Gallery, the auction will take place on 17 November. 100s of anonymous miniature works of art will be exhibited and auctioned off in secret bids to raise money for The Hepatitis C Trust. The aim of the charity is to raise awareness about the disease, end discrimination against people living with hepatitis C, and provide them with support. I'm really pleased to be contributing a postcard artwork for the third year running (the image is top secret for now), it's a wonderful event to be part of, I hope you can make it to the launch, and please do bid bid bid on one of the artworks! I've been busy in the studio working on a commission, the painting is for a record label which will launch in 2017. I've been creating a mythical street landscape which is based on the architecture of East London that I've come to love and know so well. I took my camera out for the day and wandered the streets, photographing shop fronts and the flats above them in Shoreditch, high rise council blocks, little terraced houses in Stepney. Having this commission to work on has been a nice change from my own projects, something entirely different to focus on. I will have more info to share about this commission and the record label soon, plus an image of a finished painting! This weekend Matchmakers Wharf will be opening it's doors to visitors. There are 50 studios in the building, and many of the resident artists will be welcoming visitors into their spaces. Pop in for a cup of tea, a chat and a browse. I have had a studio at Matchmakers Wharf since 2012, I'm in Studio 40. This weekend I will be in my studio welcoming people in to see some work in progress and a selection of finished works, I hope you can stop by and say hello.